I have two children – Tori is 6 and Tyler is 11. We have four dogs, three of which are pit bulls. Bandit, our black and white, is 8. He is so gentle with both kids. As you can tell from the pictures, he allows Tori to dress him up. Poor dog! I’m surprised he doesn’t have issues from it! She can just walk in the room, and he stops everything he is doing for her. He is her true proctor. He loves when Tyler comes home from school to just love on him. His favorite thing is when Tyler gives him belly rubs. Baby is our only girl dog. She is now 6 and is brindle. She is the lover out of them all. When the kids lay on the floor to play, she gives the sneak attack. She loves to give kisses to them both. She loves to go outside and play football with Tyler. She loves to chase him and tackle him when they play. She loves for Tori to sit still for five minutes and will climb up beside her and cuddle. Last but not least is our new addition Spartacus. We adopted him back in October from a local shelter. Spartacus has become quite famous now that he is on Facebook. But the kids helped him get there. He was a puppy who didn’t know how or what to do when we brought him home. Tyler broke that shell with coming home every day just to play with him. But I can honestly say Tori is his favorite. Wherever she is you will find him. He doesn’t like it when she is upset or crying. He will kiss her till she is better. He loves to rest next to her and listen to her read or sing. They sleep together, and he cries when she leaves for school. She has become his best friend, and he has become hers. 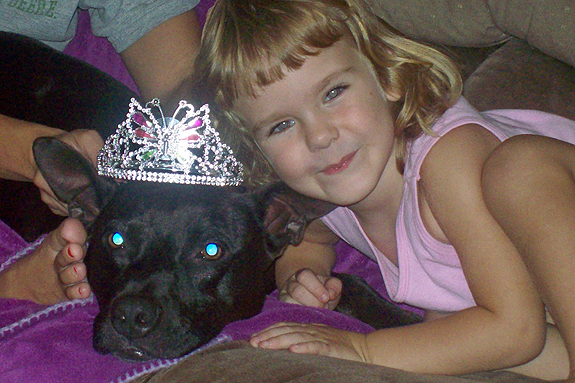 Bandit and Baby were the first pit bulls the kids have ever been around. 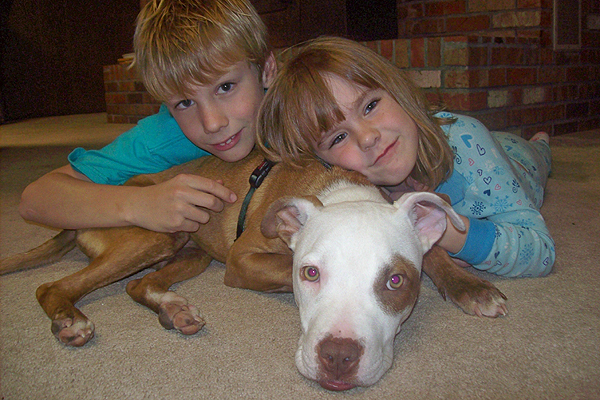 The kids loved them on the spot and have become huge on speaking up for pit bulls. 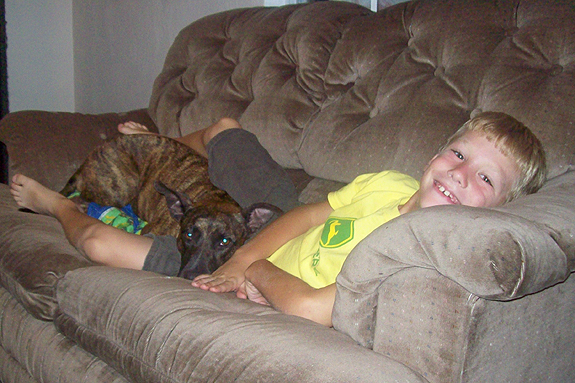 My son actually turned a family in for abuse they were causing to a neighbor’s pit bull. My daughter talks about our four-legged kids at school all the time. She has actually taken a liking to letting everyone know it isn’t the breed, it is the human who makes them. Congratulations on your furry kids 🙂 But a BIG congrats to your kids on being great ambassadors for the breed! Kids know best and in my opinion are some of the Best to learn from!